Producer and music executive Michael Knox has joined peermusic as Senior Creative Director. Following his string of recent successes in the studio, Knox will maintain his role as a producer, in addition to his new publisher duties. For peermusic, he will focus on identifying and signing songwriters, and working closely with other staffers in sourcing and developing talent globally. 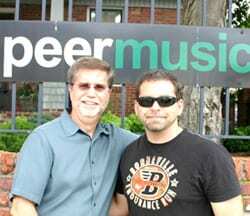 Peermusic VP Nashville, Kevin Lamb, announced the company’s latest hiring. “We are thrilled to have Michael on board,” he says. “Michael and I have been talking about this for some time. Peermusic/Nashville has recently purchased several catalogs including Malaco Music, Route Six Music, GrangeHill Music and James Strouds’ WS Music Publishing. They have been honored with SESAC’s Christian Publisher of the Year award for the past three years and received two Dove Awards. Peer’s Nashville based advertising division, overseen by Craig Currier, has provided music for major campaigns with Lincoln, Chrysler, GE, Guitar Hero and Levi’s. Television advertisements currently airing include Volvo and Tostitos.